This young Cardinal is in the midst of change. His beak is orange, not black, which means he is not a fluffy fledgling like I first thought. I think it is a young male, within a year old, that is molting, shedding baby feathers to reveal red feathers. 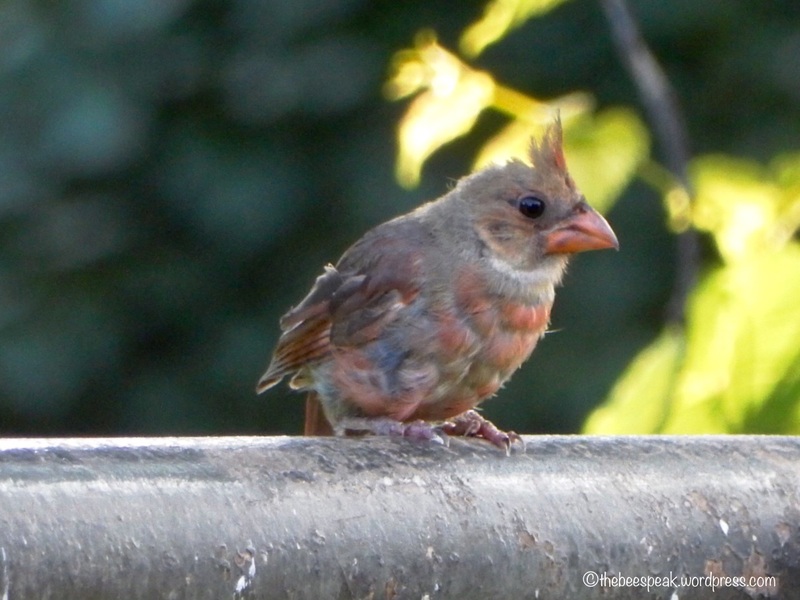 From what I have read, the juvenile male Cardinal looks much like the more drab female until he is a year old. Then, he goes through the molting process to become bright red! This was news to me and I have never observed it before. I also learned that all Cardinals go through a molting stage around the end of summer, shedding worn feathers in preparation for new. Isn’t nature amazing? This is my Version 2 entry into Cardinal Guzman’s Changing Seasons Challenge. 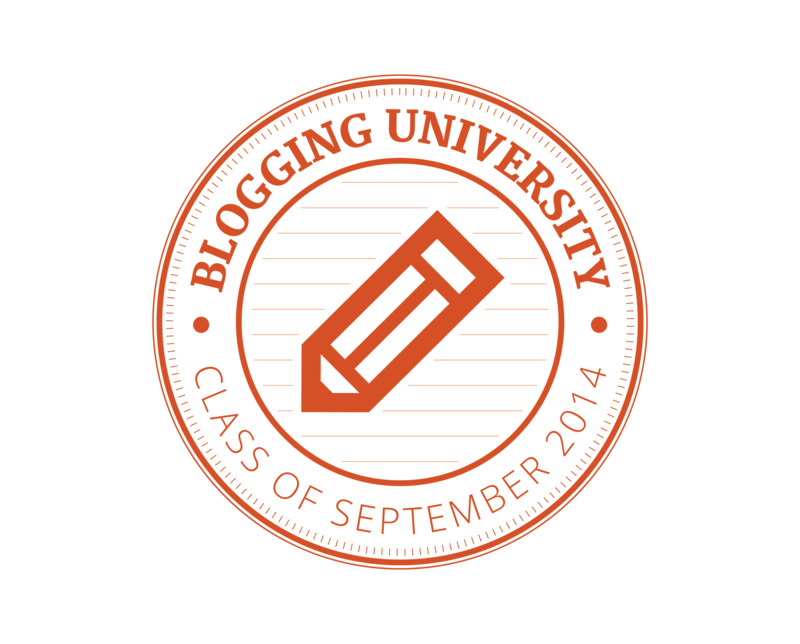 Check out his blog for other interpretations of the theme and think about joining us in the challenge! You can see my previous entries by clicking on the Changing Seasons header at the top of my page. You can click on the Birds header at the top of the page for more bird posts too. Most of my conversations with my neighbors happen across our fences. We share small talk, mostly about our pets or the weather. It’s easy conversation, friendly banter, sharing obvious common interests. We forge a connection without deep expectations. Neighborhood bonds seemed tighter when I was a youngster. Now, my neighbors and I seem content with a wave, a smile and a few kind words. I imagine there are different social rules in every neighborhood. What’s it like where you live? 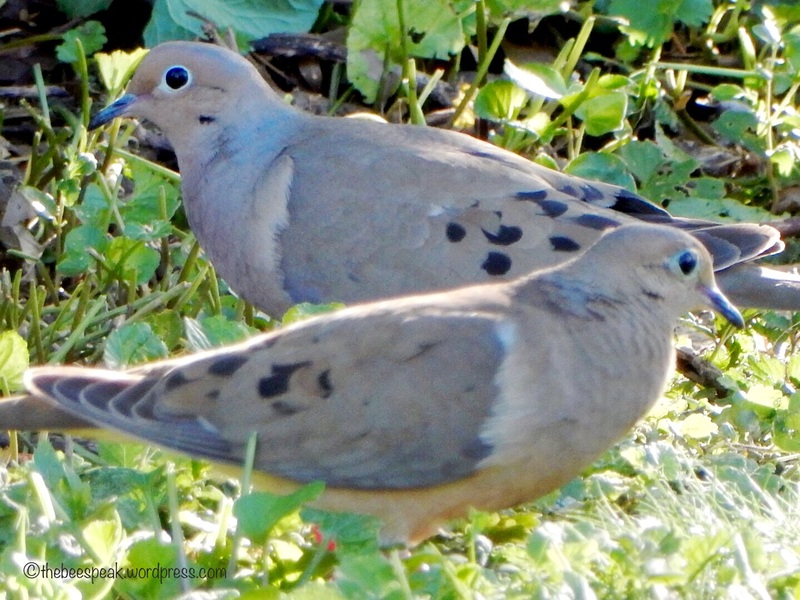 This pair of mourning doves is always seen together as they venture into my yard for food. I love the gentle flutter of their wings and the soft song they sing. 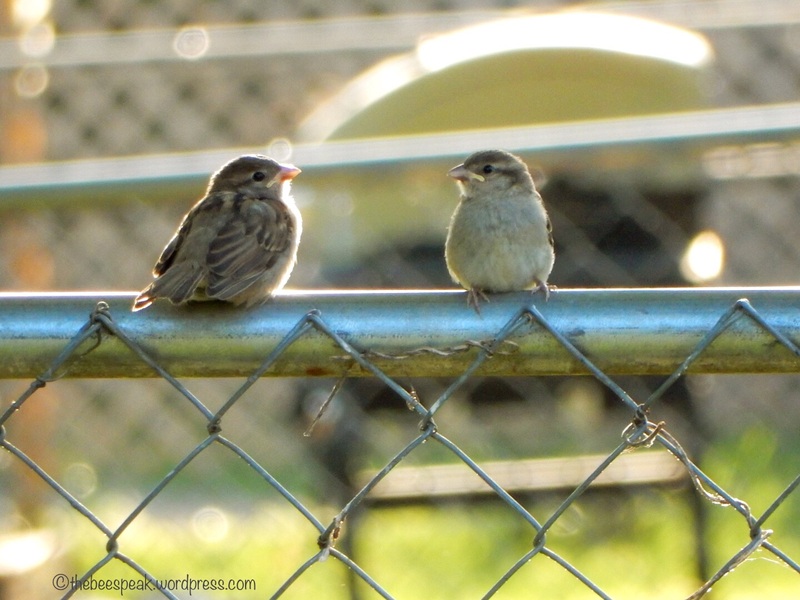 In case you hadn’t noticed, I love watching my backyard birds. I am learning how long they take care of their babies! It was fascinating to see all the male birds feeding their babies too! 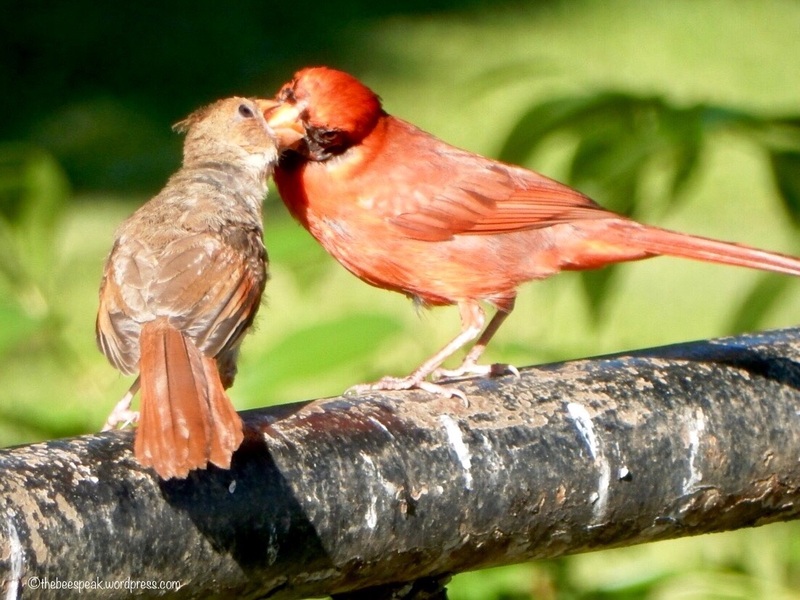 This bright red cardinal brought bite after bite of food from my feeder up to the fledgling! 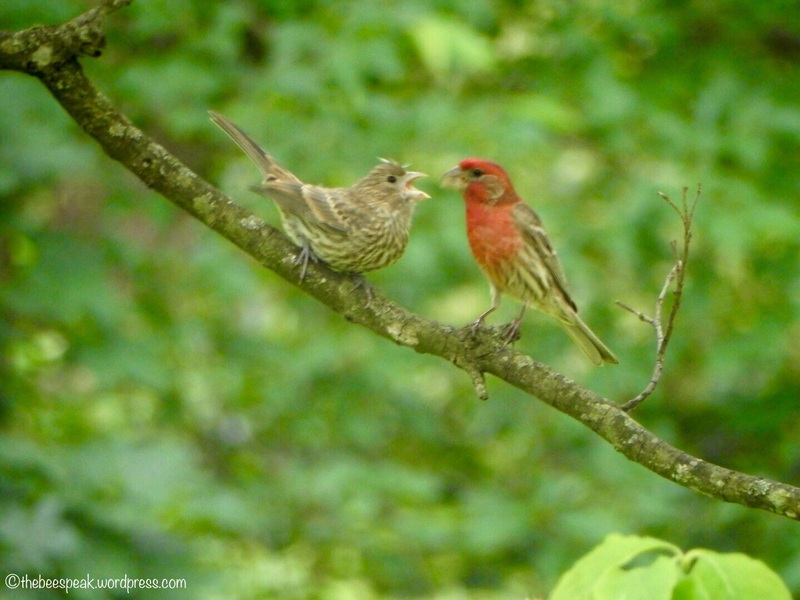 I also saw this colorful house finch carrying food up to his baby in my dogwood tree! 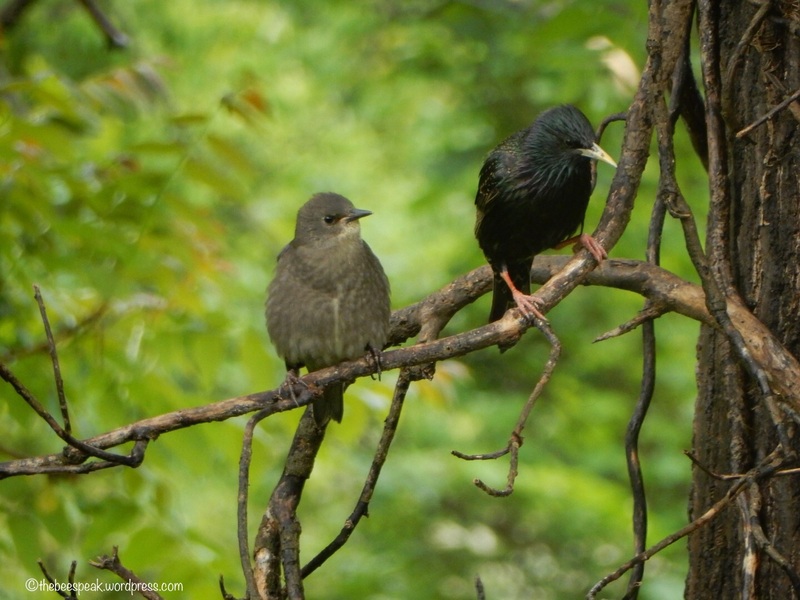 Not to be outdone, this dark,iridescent starling watched over its baby in my oak tree and showed it how things should be done. I previously shared posts about the nurturing ways of the downy woodpecker and of the house sparrow if you care to take a look. For more bird posts, you can click on the bird header at the top of the page! I have become obsessed with the pure beauty, color, features, and instinctive nature of birds. 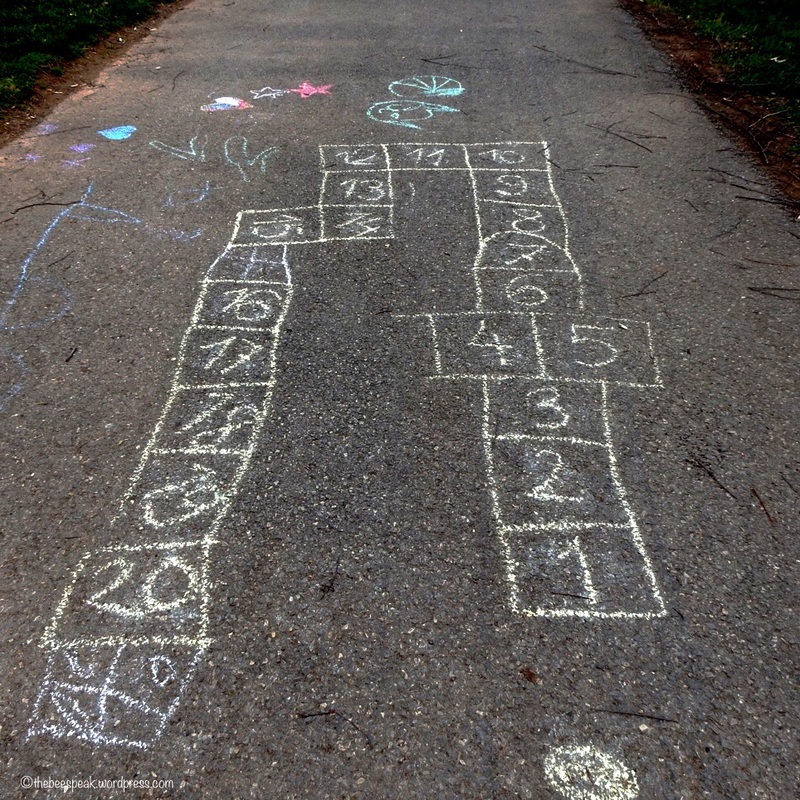 Walking around the park, it made me smile to see this game of hopscotch drawn on the park walkway. When I was a kid, we searched to find “chalk rocks” in our yard to draw squares on the sidewalk in front of the house! Searching and drawing was as much fun as tossing and hopping!